*The cover was designed by Dinah Fried at Chronicle, and then painted by Toronto based artist Amanda Happé. I love it so much and am proud to have had such talented people working on this project. 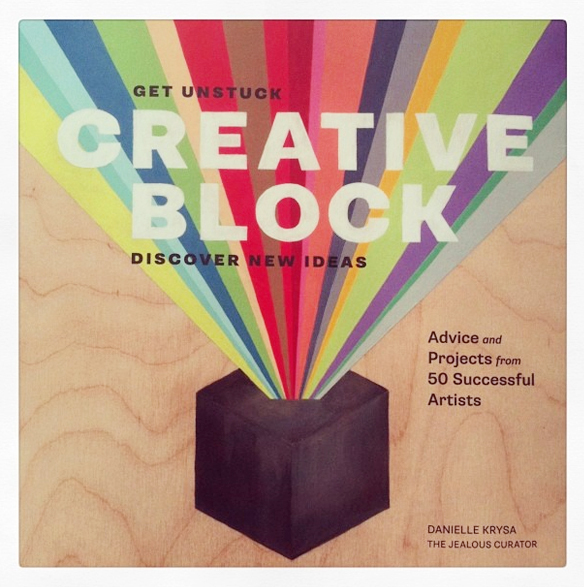 I came up with the idea for CREATIVE BLOCK for myself, just as much as for all of you. I wanted to make something beautiful – a contemporary art book filled not only with inspiring images, but also inspiring words, advice, and tips to help amateurs and professionals alike, find their way through those days when the ideas just won’t come. Because everyone who dabbles in something creative feels that way at some point – right? Right. I wanted to write this book to show you that if you’re feeling this way you’re not alone either. I’ve written hundreds and hundreds and hundreds of posts about successful, working artists who seem to have this whole “creative thing” figured out. But surely they have blocks from time to time? How do they get through them? Where do they find fresh inspiration? How do they handle negative feedback? Does it stop them in their tracks? Now, these full time artists don’t have the luxury of not finishing, or giving up on a project – not when they’ve got a gallery or art buyer waiting on them! So how do they push themselves through those moments when the ideas just aren’t there? Or when the ideas are there, but their hands or materials will not cooperate. Finally! I’m thrilled to reveal the list of 50 amazingly open, honest, witty, thoughtful, funny, talented artists that allowed me to interview them about their own creative blocks, insecurities, and inner-critics. Not only did they give us a candid view into their creative process, but each of them wrote a “creative unblock exercise” to help shake us out of our own blocks. Amazing? YES! Gah! Almost 300 pages of stunning contemporary artwork, insightful advice, and creative-unblocking tips. It’s soooo good, all thanks to that amazing list of people who have been such a huge inspiration to me. I’ll hope, actually I know, they’ll inspire you too! The book is now on shelves, all over the world, as of March 2014, and online via GREAT.LY, Chronicle Books, and all of the other usual suspects. Check the side bar for upcoming book signing events! See you there! ps. Thank you so much to Jerry Saltz, Brené Brown, and Faythe Levine for writing endorsements that will appear on the back cover – I love that you love it! Fantastic! Can’t wait to see it. Happy for you!! Looks great!! This is so exciting! February feels so far away! Lisa Congdon! <3 I knew her on this page and now im her fan! this book will be sooo amazing! Congratulations!!! Cant wait to read it!!! Congratulations Danielle!! You did it, I can’t wait to hold it in my hands!! So well deserved! And filling a HUGE need. I can’t wait to read it and even better, to USE it in my day to day work. Brilliant! Am thrilled to read this. Congratulations – this is a book I cannot wait to read and I am sure lots of others feel likewise. Enjoy your well deserved success. sure! thanks molly… i’ll give you a shout! I’m super freaking broke but this is the first thing on my Christmas list! Hooray! It looks so good! I can’t wait to get it! So much talent in there. Congratulations, Danielle!! What a kickass topic! I could not be more excited to read your book Danielle! You’re an inspiration in so many ways, and I appreciate so much how you’ve channeled your personal artistic challenges into something others can benefit from. Hooray and congratulations! How exciting – and many congrats! I never leave comments but OMG I am so excited for your book! Your blog really is amazing and inspiring! Congratulations on your upcoming book. I can’t wait to get my copy! If it’s as good as your blog, it’ll become one of my favorites “goto”s for inspiration! I NEE-EED this, ASAP! ;D Congratulations! Can’t wait to get my hands on this gem! Sounds like a interesting book, congratulations. hi chris, yes the book will be available in all sorts of bookshops, big and small. it’s just pre-released on amazon (through chronicle). Pre-ordering seems like a very small payment (and great reward) for what always pays off as an important, relevant, and valuable resource. Thanks! Always jealous of the Jealous Curator. congrats! i was surprised at the price of the book – i’m definitely per-ordering! I have a copy of the book sitting beside me as I write this. It arrived yesterday. It’s a FABULOUS book!!! I’m so very, very impressed! Way to go, Danielle! Well done!!!!! I would encourage everyone, artistic souls or not, to purchase a copy. You will be glad you did!!! Can’t wait to lay hands on a copy! !